The Super Happy Magic Forest is once again thrown into disruption and chaos when Blossom the unicorn accidentally releases the super slug of doom from his hibernation beneath an ordinary rock. Can our five reluctant heroes -- Hoofius, Blossom, Twinkle, Trevor, and Herbert -- once again save their beloved forest from slimy, sludgy, yucky evil? We sure hope so. . .
A delightful, riotous, laugh-out-loud follow-up to the 2016 BCCB Blue Ribbon Award Winner and 2016 Booklist Editors' Choice, Super Happy Magic Forest. 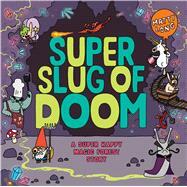 Lovers of silliness, fantasy, and lots and lots of slime won't get enough of it! Matty Long is the author and illustrator of Super Happy Magic Forest, which was shortlisted for the Waterstones Children's Book Prize. Matty earned a master's degree in children's book illustration from the Cambridge School of Art in England, where he lives.